For information on becoming a naturalized United States citizen, visit the U.S. Citizenship and Immigration Services (USCIS) web site at: http://www.uscis.gov. Unless noted below, ceremonies will be held at 11:00 a.m. in the Ceremonial Courtroom (Room 2306) on the 23rd floor of the Richard B. Russell Federal Building and U.S. Courthouse. You must arrive at the courthouse on the date and time listed in the notification letter sent to you by the USCIS. Petitioners must check-in and review paperwork with the USCIS representatives prior to the start of the ceremony. Copies of your Certificates of Citizenship can be obtained through the USCIS. Visit their website at www.uscis.gov and download form N565, and follow their instructions. 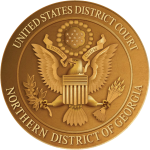 For information on obtaining a copy of your Name Change Petition, contact the Jury and Naturalization Office at 404-215-1640. After the office confirms that there is a name change petition on file for you, you may obtain a copy in person or request one by mail. The cost is $11.50 for each certified copy. To request a copy in person, you must go to the Clerk's Office intake counter on the 22nd floor of the Richard B. Russell Federal Building and U.S. Courthouse. When paying in person, you may pay with a credit card or cash (exact change only), in addition to a money order or cashier's check.